School mascot banners hanging from the ceiling. Condiment centers to hold supplies and dispensers. 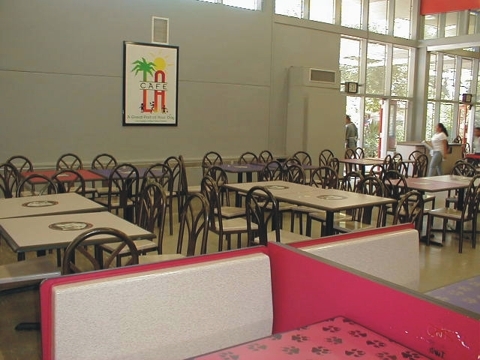 Pedestal tables with freestanding chairs give this room multi-purpose ability- plus enclosed trash units against the wall and a 5 foot diameter round Wolf mascot looking out over the students. 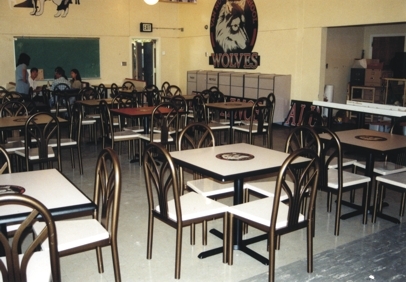 Interesting layout with school mascot logos inlaid in the tabletops — also wolf paw print logo graphic tabletops.